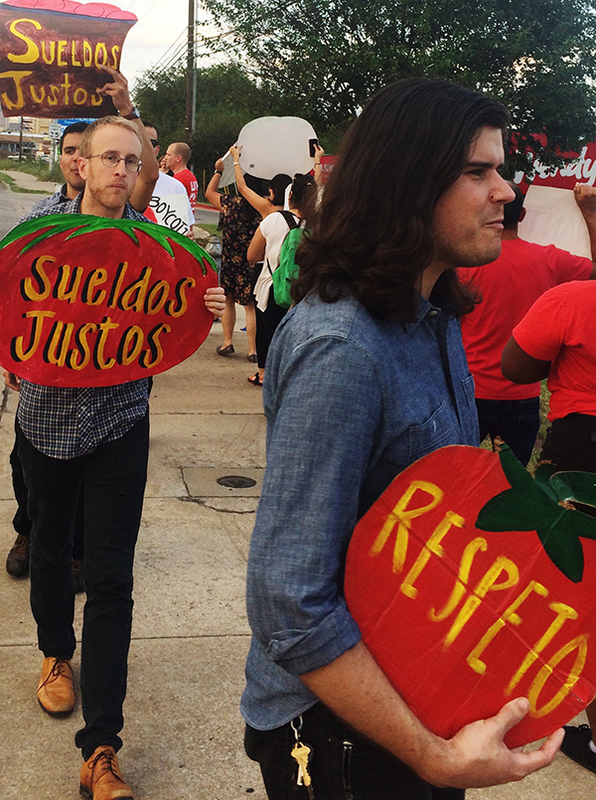 Rio Grande Valley, Austin, San Marcos, San Antonio take the call for farm labor justice to Wendy’s doorstep! We have had occasion to quote those words, attributed to Dr. Martin Luther King, many a time over the 25 years that we have been organizing here in Immokalee. The quotation reminds us that, though at times it might seem that progress has grown unbearably slow or even ground to a halt, it never truly stops, and that, when viewed from a sufficient distance, the trajectory of history bends only one way — toward greater freedom and equality. And indeed, in the case of the Campaign for Fair Food and the Fair Food Program to which it gave birth, those words have always rung true. Progress, though at times frustratingly slow, has never stopped. Change, in the form of expanding protections for farmworkers’ fundamental human rights, has always moved forward, sometimes inching along the way, sometimes in leaps and bounds. But today, many people may find their faith in that prophetic phrase shaken. Indeed, to many it may feel that our nation’s better angels have failed us, that our country has turned back from its path toward justice, that recent events may have actually succeeded in twisting that majestic arc toward a time of lesser freedoms, of greater fear. What matters most is not who is sitting in the White House, but “who is sitting in” — and who is marching outside the White House, pushing for change. And even in this dark moment, we must remember that more people across the nation cast a vote for a vision of a more just and equal society than those who did not (marking just the fifth time in 240 years of US history that the candidate who won the popular vote lost the election). 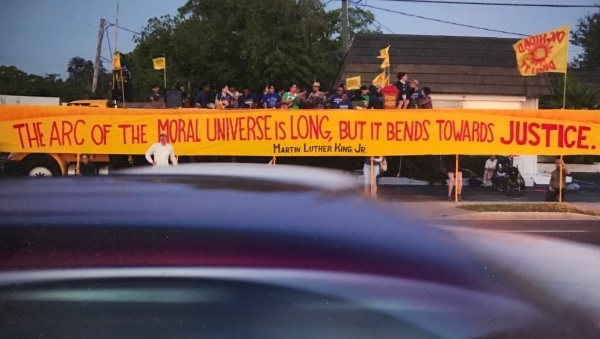 In short, the arc of the moral universe is still ours to bend, and if the story of the Fair Food movement is any indication, bend it we will. The Fair Food movement is fundamentally a human rights movement. Yes, it is about immigrant rights, but non-immigrants work in the fields too and they are every bit as exploited and abused as their immigrant brothers and sisters. And yes, it is about labor rights, but it is about women’s rights as well, both in the fields and at home in the fight against domestic violence. It is even about consumers’ rights, the right to demand that, in the 21st century, food corporations no longer turn a blind eye to abuses in their supply chains, but use the power of the market to help fix the poverty and exploitation that their purchasing policies have driven for so long. Indeed, the Fair Food movement is fundamentally a human rights movement, a broad and inclusive human rights movement. And that, perhaps more than any other factor, has been the secret to its success. If we as Americans are to protect the fragile progress toward ever-greater social justice that we have made across the generations, we must fight together, in a broad and inclusive movement to protect our rights — immigrant rights, women’s rights, LGBTQ rights, civil rights, labor rights, our right to health care, our right to religious freedom, our right to a clean and sustainable environment, our right to a fair and equitable economy, and more — our human rights. If each of those sectors faces the challenge alone, we will be weak, we will be on the defensive, and we may lose ground. Together, however, we can define the agenda, one that fosters a vision of universal human rights, and we can win. America has given birth to many great movements across the centuries, from the fight against monarchy to the fight for universal civil rights. In this new century, perhaps it is time for a new American movement — the American human rights movement. If so, the Fair Food Nation will be there. With four whirlwind “Behind the Braids” tours already behind them, farmworkers from Immokalee and their allies hit the road again last week, turning their sights this time to a longtime hotbed of Fair Food action: The Lone Star State. From the Rio Grande Valley and Austin to San Marcos and San Antonio, the Immokalee crew swept through Texas with community gatherings, school presentations, animated actions, and collaborations with incredible grassroots and student organizations. The Texas Tour started off with a bang! Along South Texas Boulevard in Weslaco, we were joined by seventy community leaders from around the Rio Grande Valley, including members Fuerza del Valle, a longtime CIW ally and workers’ rights powerhouse whose support stretches back to the beginnings of the Campaign for Fair Food. Spirits were running high among the protesters gathered that sunny Saturday afternoon, raising colorful Fair Food banners and singing chants at the top of our lungs as we started marching along the sidewalk. Once we arrived to Wendy’s, the scores of community members started a picket before a delegation made its way into Wendy’s. The delegation was immediately met with resistance. The manager, after refusing to allow the CIW or Wendy’s own local customers speak, proceeded to call the police. In spite of the cold shoulder, the delegation left even more animated than when they had entered, rejoining the upbeat protest outside ad continuing the protest with our flags and boycott banners held high, drawing support from many drivers and passersby. The spirited action was then followed by a gathering with members from Fuerza del Valle, which generously hosted the CIW at the office of the Edinburg American Federation of Teachers. Together, the CIW’s Lupe Gonzalo and other workers shared their motivations and their vision for worker-driven social responsibility, building bonds of solidarity that anchored everyone in the room not only to the Wendy’s boycott, but also to the movement for basic human rights in workplaces across the nation. After the visit to the Rio Grande Valley, we headed off to Austin and San Marcos. First up, we were hosted by the Workers’ Defense Project and the Fight for 15 at a community gathering that was followed by two back-to-back days of class presentations. 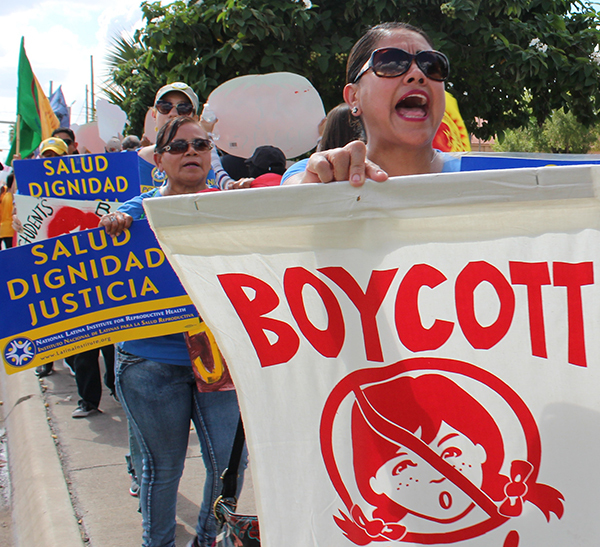 As we visited classroom after classroom in universities like St. Edward’s University and the University of Texas in Austin, hundreds of new students committed themselves to strengthening the boycott even as Wendy’s tries to ignore the voices of student consumers across the country. From there, we were invited to San Marcos, where we held class presentations at Texas State University and a screening of the award-winning documentary Food Chains at el Centro Cultural Hispano de San Marcos. To wrap up our region to that corner of Texas, it was back to Austin for more action! Scores of students, members of the Workers’ Defense Project, organizers from the Fight for 15, and community members from Austin gathered for a lively picket with both long-time and brand-new allies from the community. Finally, we made our last stop in San Antonio. From the “El Mundo Zurdo” Conference to presentations at the University of Texas at San Antonio and meetings with the Southwest Workers Union, we witnessed even more young people take up the Fair Food banner. With that, we wrapped up an incredible tour of the Lone Star State, and left inspired: we saw students, workers’ rights organizations, people of faith, and communities not only join our presentations, screenings, and actions, but also commit to deeper, long-standing support of the Wendy’s Boycott in their home state. 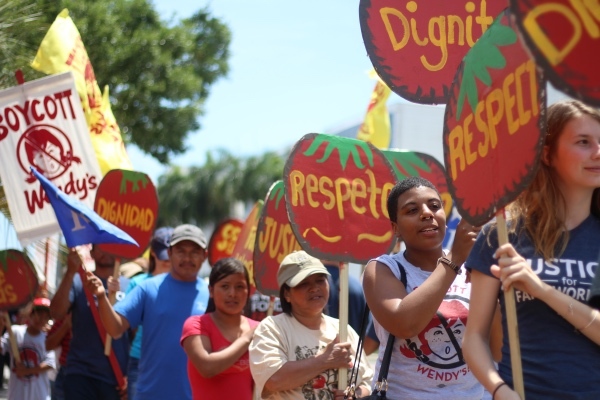 We have no doubt that the good people of Fair Food Texas will continue to pressure the fast-food hold-out until Wendy’s finally comes to the table with the workers who pick their tomatoes. 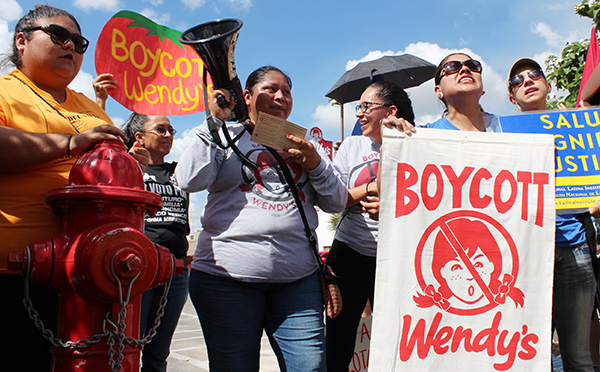 “Behind the Braids” Wendy’s Boycott Tours hit the Mid-Atlantic!